The program is set up to allow those who have never before laid a hand on a drum to feel at ease when doing so. 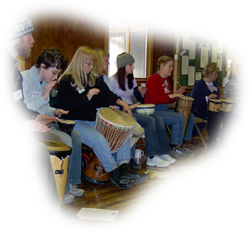 In general, a session lasts one hour but can easily be extended depending on the enthusiasm during the closing improv drum circle session. To lay a foundation to understand the significance of rhythm in all music. To become familiar with the two basic sounds of a drum: bass & tone—and be able to incorporate them into a basic, traditional rhythm. To establish a comfortable setting that will minimize feelings of self-consciousness, fear, ineptitude, or embarrassment. Typically a simple “going around the room” is enough. However, some “shy” groups may benefit from a fun icebreaker-type activity to get them comfortable speaking. Why drumming? What is rhythm? Continue to get familiar with the instruments by engaging in one or two rhythm games from the Let’s Drum game list. Discuss what transpired from the activity. Positioning the drum, posture, hand positions, etc. Where to find the bass and the tone. Practice bass & tone via repetition from instructor. Introduce a culture by picking a drum and studying it. What is it body made from? What is the head made from? What type of environment would have these materials available? Are there any designs, carvings, or drawings? What do they represent? Through deduction participants should be able to determine a general area of the world where the instrument(s) come from. They will then have the opportunity to come up to the full-sized map and attempt to locate the country of origin. What is the first thing that comes to mind when I say (name of country)? What is it like there? Where do the people live? What do they wear? What do they eat? What languages do they speak? What do you think this instrument is used for? Ceremonies? Recreation? Communication? A very basic rhythm will be introduced on the proper drum of that particular culture so that participants can observe the traditional way of playing. The name of the rhythm (and its meaning if any) will be discussed along with the introduction of various other words from the native language. Through various methods of repetition provided by the instructor, students will then proceed to simulate the rhythm on their own instruments. What is improvisation? What is it purpose for playing this way? What is a drum circle? How do drum circles work? Why a “circle”? A rhythm will be started by the instructor allowing others to add in with anything at their own will. As the participants feel comfortable with the rhythm they have going, the instructor will stop and introduce other instruments and rhythms on top of the playing in order to spark new ideas among the participants. Why is this working (or not working)? A final rhythm will be started by one of the students (most likely the traditional one we learned earlier) to see if it will morph into another rhythm by the time we’re done playing. Note: If the time during this final activity exceeds 1-hour and it is okay with the venue, the circle will continue for as long as participants care to go.